I previously posted about the threat to Undershaw, the Surrey home of Sir Arthur Conan Doyle, in 2007. As I noted then, quoting The Guardian, it was at Undershaw that Doyle "wrote the 'Hound of the Baskervilles' and a patriot defence of Britain's Boer War; resurrected Sherlock Holmes, having previously thrown him off the Reichenbach Falls; campaigned for justice for the falsely accused solicitor George Edalji, and attempted to learn the banjo." Anyone who has read Julian Barnes's magnificent novel Arthur & George will feel that they know every inch of this house (shown above in 1897). At the time, I expressed the hope that the worldwide network of societies devoted to Doyle and his immortal creation, Holmes, would be able to rally private support to rescue the house from developers. The following update is cross-posted from The Folio Newsletter, December 2010. "Undershaw, Sir Arthur Conan Doyle's home in Hindhead, Surrey, is the subject of a legal bid by campaigners aiming to prevent it from being converted into flats. The house, which overlooks the South Downs, was built by Conan Doyle in 1897 for his wife Louisa, who suffered from ill health. After her death a decade later, he sold it. The house is virtually untouched from the period and retains such features as the family coat of arms, which appears on the impressive stained glass windows. Undershaw also remains significant to fans of Conan Doyle as the place where he wrote many of his most famous works. With continued uncertainty about its future, however, it is in a state of neglect and has been boarded up because of recent acts of vandalism. "The Undershaw Preservation Trust claims to have identified a buyer for the property who wants to restore it to its former glory as a single family home, but has so far failed to convince the local council to stop developers from pushing forward with plans to convert the property despite its status as a listed building. Julian Barnes, Stephen Fry, and Mark Gatiss are among those supporting the Trust in its legal action. 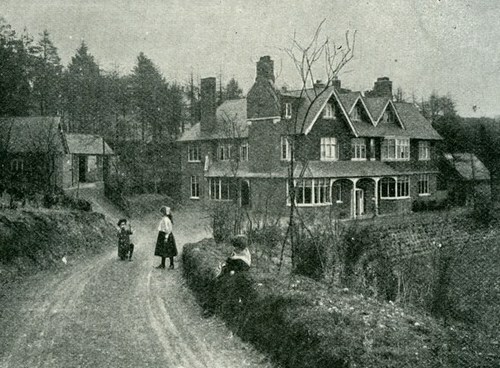 "The Trust sees Undershaw as the last physical link to Conan Doyle. 'This house is part of Conan Doyle's history and it is important to remember that if these plans go ahead, there will be no going back,' say Trust representatives. 'The work will be irreversible.'" You can read more about the Undershaw Preservation Trust and how you can help its efforts at http://www.saveundershaw.com and http://undershawhelp.blogspot.com. Brilliant photo! Yes, I read the Hound of the Baskervilles at school, and Holmes' patriot defence of Britain's Boer War since school. And in the last year or two I read Barnes' book about the campaign for justice for poor, sad George Edalji. I saw that in the Guardian. It would be such a loss. Surely the National Trust should be involved here. Just found your blog, wonderful wonderful wonderful! Have a prosperous and happy New Year! Thank you for this marvellous write-up regarding the former home of Sir Arthur Conan Doyle. As Assistant Director of the Undershaw Preservation Trust I wish to thank you for raising awareness of our campaign on your page. 2011 is a very crucial year for Undershaw. With a Judicial Review in the High Court imminent, we hope for success and justice in our bid to overturn Waverley Borough Council's decision to develop. Just discovered your blog. Have seen the Muybridge exhibit at the Corcoran in DC before it crossed over to the Tate. I am a new blooger - VictorianCalendar@blogspot.com - an event per day "ripped from the headlines" of the Victorian scene. If you have the time, please have a look and your thoughts would be welcome. Thank you.